President Trump looks at the sun without protective gear during the solar eclipse of Aug. 21, 2017. Like millions of other Americans, President Donald Trump and his family got a peek at today's historic solar eclipse. This afternoon, the president, the first lady and their son Barron stood on a White House balcony, put on their eclipse glasses and stared up at the sky. However, at one point, Trump was seen looking upward, without protection. According to Wall Street Journal reporter Ted Mann, one of the president's aides yelled "Don't look!" in an attempt to protect Trump's vision. President Trump, Melania and Barron observe the solar eclipse of Aug. 21, 2017, with glasses. 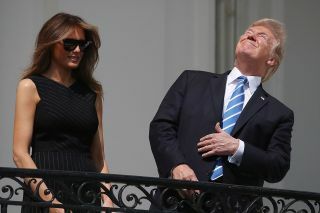 There's no word from the White House about whether Trump suffered eye damage, but he appeared to look up for only a brief moment. If you plan to look at the sun during an eclipse or at any other time, make sure you put on a pair of protective glasses or use a pinhole projector.